I recently had the great fortune of visiting Japan for a few weeks on a holiday. For many years my business partner said – you must go, you will love it. She was right! In preparation I spent a few months listening to the Pimseleur audio tapes driving to and from work. Every morning I would attempt to speak a little more. Luckily my business partner had lived in Japan previously and would converse with me daily. This did come in handy during my trip. Hint – be sure to have directions written in Japanese should you choose to hop in a cab, most drivers don’t speak English. Japan is so unlike Canada in many ways. The formality of the people, everything you look at is steeped in tradition and history. My friends loved the abundance of seafood, sushi and of course the noodles. For me, the architecture was it. There is nothing better as a designer than the ability to visit in person and see a building or a space you studied in school or have glossed over many times in magazines and books. Below are just a few of my favorites and most memorable stops. We visited many of the neighborhoods in Tokyo, each so unique. One sunny day we thought it would be fun to take the train to the “Harajuku” area and see all the colorful and quirky teenage girls dressed up. Unfortunately it was a school day so we only caught a glimpse of a few, however on the other side of town is a tree lined street called Omotesando. Here was an architectural dream of “who’s who”. Couture store upon store, but forget the fashion (for a moment). It was the buildings themselves. Prada the tall iconic glass structure by the famed Herzong & De Meuron and modern concrete form that housed the Tod’s store are only two of many that line this street and fought for your attention. As I was standing across the street taking photos a women walked up to me who was an avid traveller from Jerusalem. She knew every building, and architectural firm that had designed it. Delighted to have someone to converse with she told me she visits Japan once a year just to see the architecture. She gave me a tip and suggested I must stop at this lovely pineapple bake shop a few blocks away. She did not disappoint! 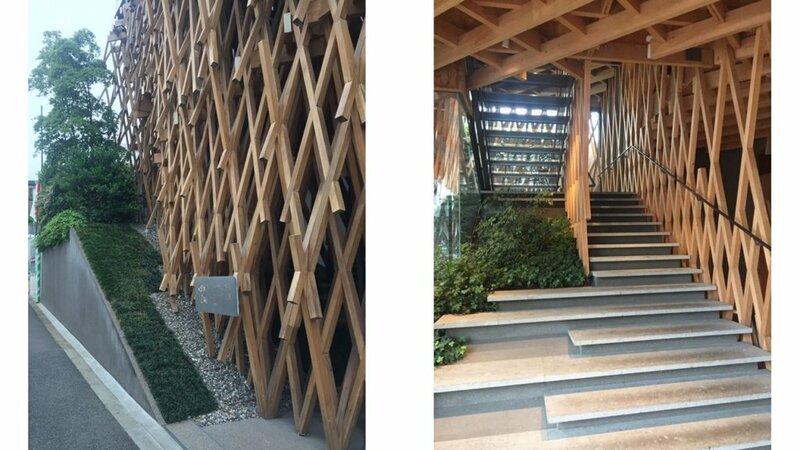 SunnyHills cake shop designed by Kengo Kuma was one of the coolest places I saw during my trip. The space has been featured in multiple magazines like Dezeen, Detail, and Arch Daily. The building consists of hinoki cypress and takes its inspiration from Cidori, a traditional Japanese toy in which timber slats are joined by means of milled cut-outs, not by nails or other connectors. So simply stunning. Truly one of those spaces you need to see in person to truly appreciate. The interior is minimalist and modern with concrete stairs and reception which was equally exciting. The Roppongi area hosts many museums and art galleries. Only in Japan have I ever waited 30 minutes just to purchase a ticket for entry. This was at the Mori Art Museum which also houses an observation deck with panoramic views. I wondered if the Marvel: Age of heroes (which was one of the current temporary exhibits) caused the crowds. I would later decide not, after visiting many museums seems the Japanese have much more appreciation for art and design. 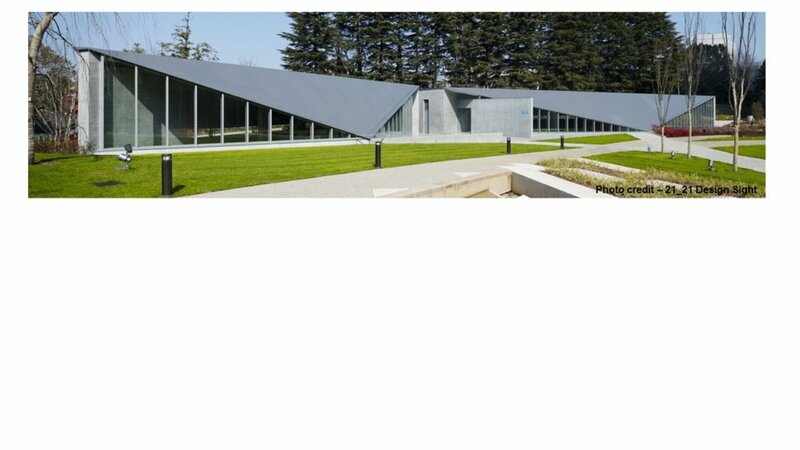 One of my favorites is designed by the talented Tadao Ando. 21_21 Design Sight is a low rise structure with steel roof plates that gently slope down to the ground. The building sits quietly among the beautiful landscaping in a park behind a massive mall, hotel and restaurants. So discreet you could almost miss it. As the website states this venue allows you to redirect your eyes to everyday things, and events and make discoveries from the design point of view. This is a space to openly communicate and evaluate the design process. The one building houses the store and current exhibit and the second seemed like a lecture hall. Wouldn’t it be great as a designer to have such an amazing space to attend an event or be inspired on a regular basis? My biggest regret was not signing up months in advance so I could attend a service at Tadao Ando’s church of light. Next visit for sure. In the meantime I was able to observe some of his handy work and details in this great museum. The public washroom even had one his famous linear light wells.